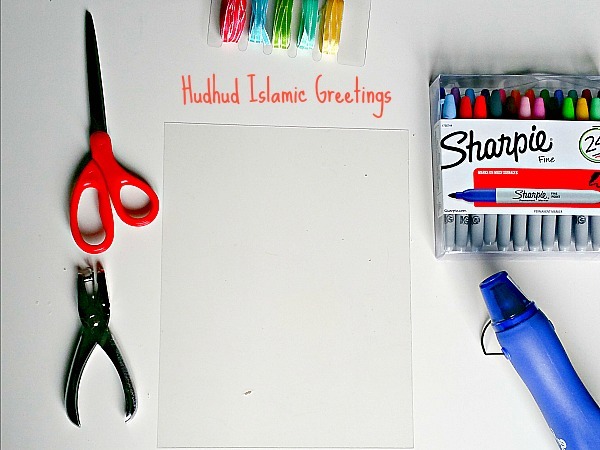 At the beginning of our 30 Day Ramadan Crafty Challenge I asked my community on Instagram if anyone wanted to create something fun for the challenge and Hend Elburi from HudHud Islamic Greetings said yes! 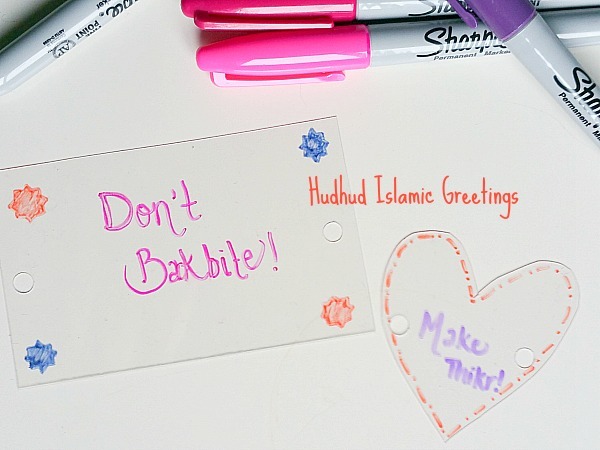 Hudhud Islamic Greetings sells high quality, modern Islamic greeting cards for every occasion. I was so excited when she sent me this tutorial, I hope you enjoy it too. Please visit her on Facebook and Like her page! Discovering shrink plastic was like magic for me. The material is also known as “shrinky dink plastic,” and is a clear plastic sheet that you can draw on with permanent marker, then cut out. Placing the sheet into the oven or using a heat gun (a blow dryer won’t work because the heat isn’t concentrated enough) will shrink the plastic into a hard, thick plastic. It is AMAZING to watch! If you do this in the oven, be sure to keep the oven light on to watch the magic. 1. Cut the sheet into the desired shape. Be careful not to cut it too small because the plastic will shrink to about 50% of its size. 2. Punch a hole or two in the sheet with the hole punch to allow thread to pass through it. A necklace charm will need only one hole and a bracelet will need two holes. 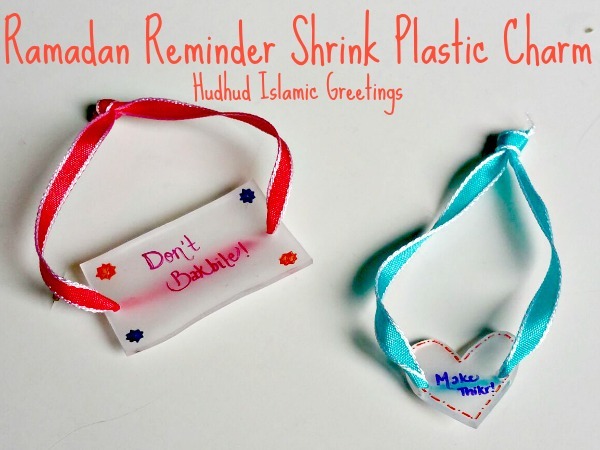 3, Draw a design or write something as a Ramadan Reminder on the sheet of plastic that will be worn as a bracelet or necklace. 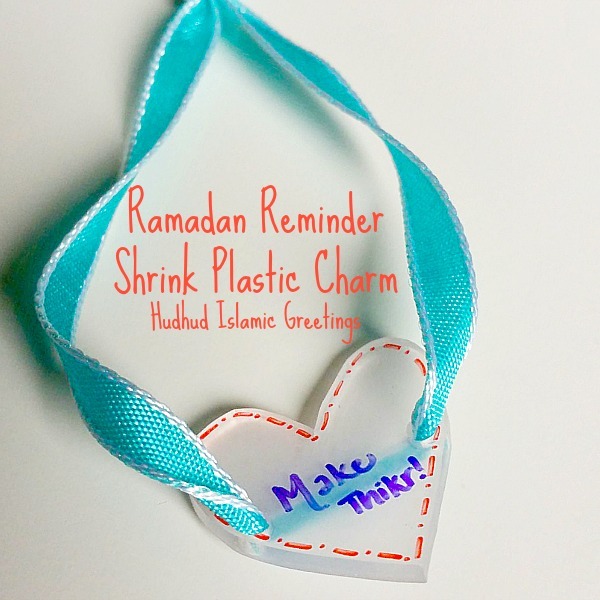 In this demonstration, the charms say “Don’t Backbite” and “Make Thikr.” The colors from the permanent markers will be intensified when the plastic shrinks, so don’t worry if the colors aren’t very dark. 4. Use the heat gun and direct the heat at the plastic sheet. It will curl and look horrible and like it’s going to be destroyed, but just wait! It will magically flatten out and harden. If you are using the oven, use the instructions that came with the sheets to “bake” it. Generally, putting it in the oven between 300 and 350 degrees for 2 to 3 minutes is fine, but keep your eye on it throughout!